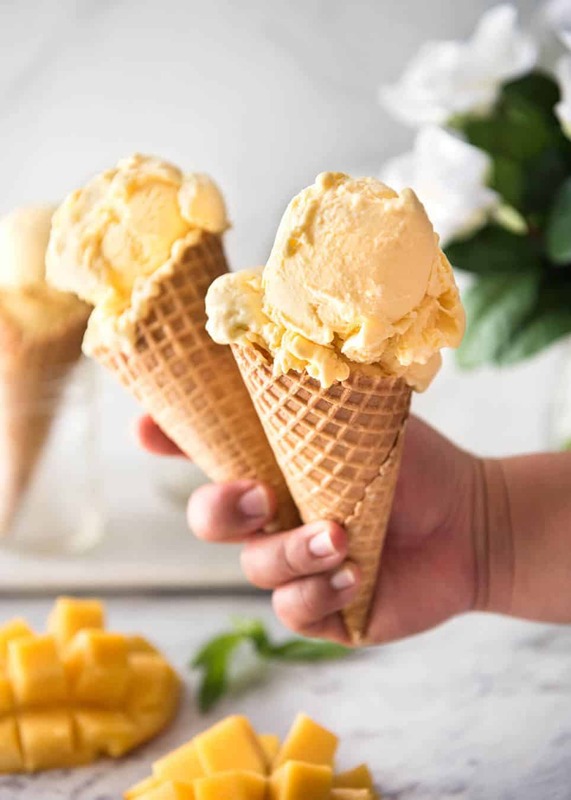 Made without an ice cream maker, all you need are mangoes, condensed milk and cream to make this homemade Mango Ice Cream recipe that is creamy and scoopable, just like the ice cream you buy in tubs at the shops. Except this is ice cream money can’t buy. Because shop bought will never be able to capture the flavour of real mango like when you make it from scratch at home! You won’t believe it until you try it. This really is a creamy ice cream made without an ice cream machine. Regular readers know one of my big gripes is pretty photos of food for so so recipes. And my other gripe is watching cooking shows where the host is serenely scooping a perfect ball of ice cream and popping it in a cone when in actual fact, it’s a frozen solid mass, and if you leave it out to soften, it just turns into a puddle of liquid. I’ve been caught out so many times! Such is the case with any recipe made with just milk, cream or yoghurt + sugar/honey. If you take it out of the freezer after 5 hours 17 minutes and 43 seconds, there is the chance that it will have frozen to that perfect stage where it is firm enough yet still scoopable. If you miss that window of opportunity by a mere second (or heaven forbid, you don’t eat it all in one sitting), it will be a frozen solid block of ice. Leave it out to soften, and, just like ice, it goes from frozen to melted. 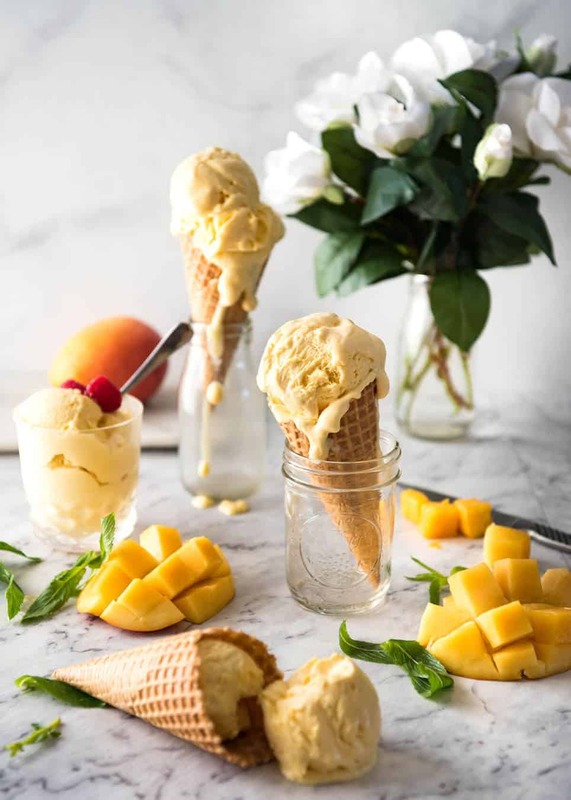 So this homemade Mango Ice Cream recipe is dedicated to all of you who, like me, have been disappointed by efforts to make a homemade ice cream in the past. That is, without an ice cream maker! ? 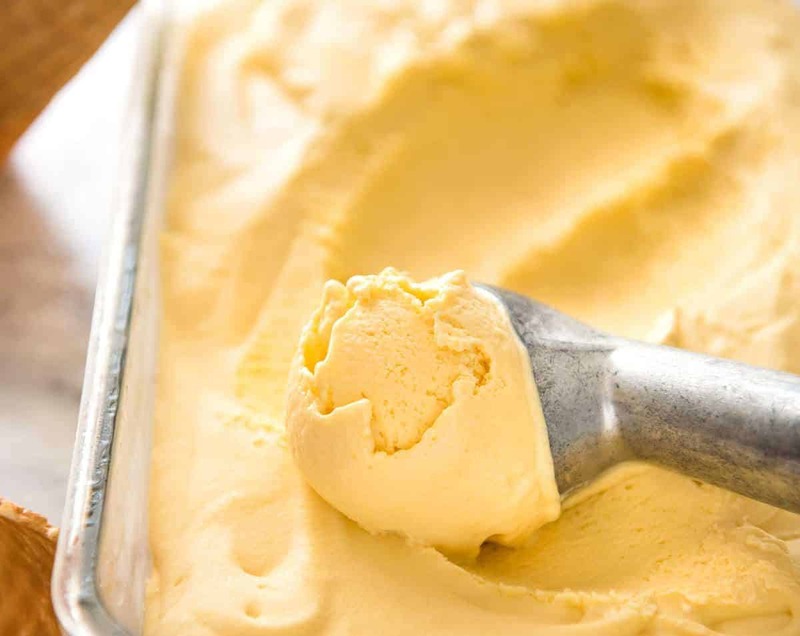 A traditional ice cream starts with a sweetened mixture of cream and eggs which is then poured into an ice cream machine which churns as the ice cream gradually freezes. The churning serves two purposes: it aerates the mixture to make it light and fluffy and it stops icicles from forming so the ice cream is creamy rather than icy. And all of this is replaced with two simple ingredients: condensed milk and cream. The whipped cream aerates the mixture and the condensed milk is the ingredient that keeps the mixture creamy, like ice cream. I must profess I don’t know the science behind why this works, I just know it does! Whip the cream, fold through the condensed milk, add a touch of vanilla, freeze it and voila! 12 hours later, you will have an ice cream that looks like it’s store bought. Go wild with the add ins! 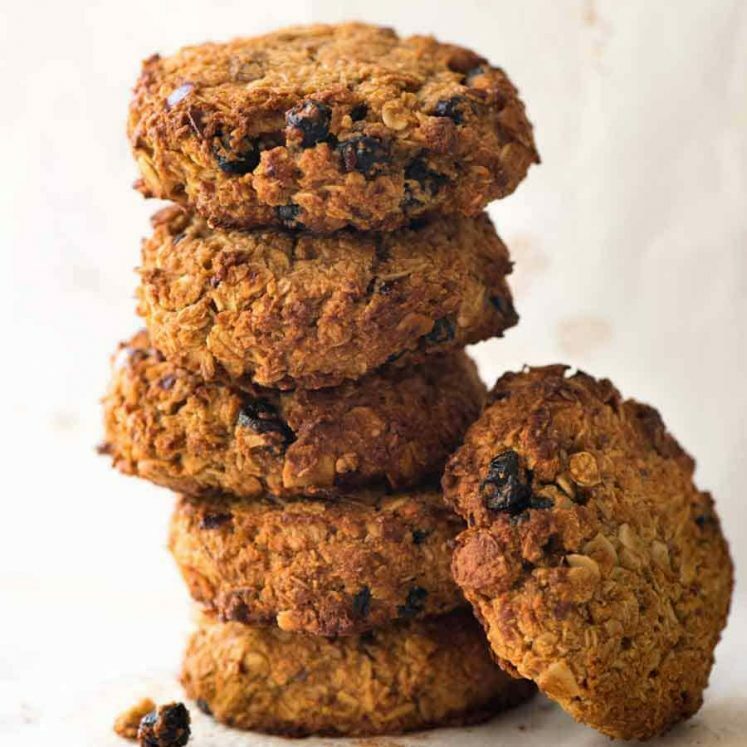 Chocolate chips, coffee, spices, rum and raisin! For this version, I added MANGOES! FOR THE FOOD NERDS ? The recipe base of condensed milk and whipped cream lends itself to flavour variations that can be stirred through (like choc chips) or infused into the cream (like spices). However, if you start adding liquid content into the mixture – like fruit purees – the addition of water based ingredients affects the creaminess of the ice cream. Originally, I just plonked pureed mangoes into the mixture. It didn’t make the whole ice cream icy, it was still scoopable and creamy, but when I ate it, there was definitely teeny tiny bits of fine icy bits in the ice cream. So to solve that problem, I reduced the mango puree by simmering it on the stove. The added bonus of this was that I could use more mango puree and thus get a more intense mango flavour in the puree, while avoiding those teeny tiny icicles in the ice cream. Finally. After quite a number of batches, I was finally happy with my homemade Mango Ice Cream. Not that I was short of taste testers, even for the initial experimental versions! And how does it compare to store bought tubs of ice cream? Well, here’s the clincher: this mango ice cream is something you simply can’t buy at the shops. This has the real flavour of mango, not a single bit of artificial flavouring in sight. It’s really incredible. For mango lovers everything, this is your mango dream come true! In terms of texture, this ice cream is creamier than ice cream made in an ice cream churner / store bought. You can see this in the photo above – you see how thick the drips are? If this was traditional ice cream, the drips would be thinner. The ice cream really is scoopable, like real ice cream. Between about 12 – 18 hours of freezing, it only needs a couple of minutes out of the freezer to be easily scoopable, like what you see in the video. After about 24 hours, it freezes firmer but the key thing is that after 5 minutes or so on the counter, it softens to become scoopable without melting into liquid which is the problem with no churn ice cream recipes made without condensed milk. We can never have enough during mango season!! Homemade Mango Ice Cream recipe video! Two areas to note: The stiffness of the cream (it’s not softly whipped, it’s stiff peaks) and how thick the mango puree is when cooked down (see how when I drag the wooden spoon across the skillet, it leaves a clear path through the mango puree). Oh! And of course, notice how the ice cream is truly scoopable like real store bought tubs of ice cream! Dice the flesh of the mango (see video for how I do it). Puree using a blender, food processor or stick blender then measure out 2 cups of mango puree (about 2 1/4 cups of diced mango). Pour puree into a non stick skillet over medium low heat. Cook, stirring constantly, for 8 - 10 minutes or until it reduces by half. The test is when you can drag a wooden spoon across the skillet and the path remains there for a second (see video). Or measure out the puree to ensure it's reduced to at least 1 cup - less is even better! Combine cooled mango and condensed milk in a bowl. Add food colouring if using. Whisk until combined. Beat cream with a hand held beater or stand mixer until stiff peaks form (see video). Take a scoop of cream and put it in the mango mixture. Fold through until mostly combined - lumps is fine (this is just to lighten it up a bit). Then pour the mango mixture into the cream. Fold through (see video) rather than mixing vigorously like you would cake batter, until lump free. This will take a few minutes. Pour into a container (preferably with a lid). I recommend glass, if you can, or other non reactive container. Place a piece of baking / parchment paper on the surface. Then place lid on or using cling wrap. Remove parchment paper. Stand for 5 minutes to soften slightly, then scoop and serve! If frozen for 24 hours or longer, it will need a couple of extra minutes to soften to a scoop able consistency. 1. I found that there is only so much mango that can be added into the mixture and maintaining the creaminess of the ice cream. So the mango flavour is not as super intense as I hoped to achieve. 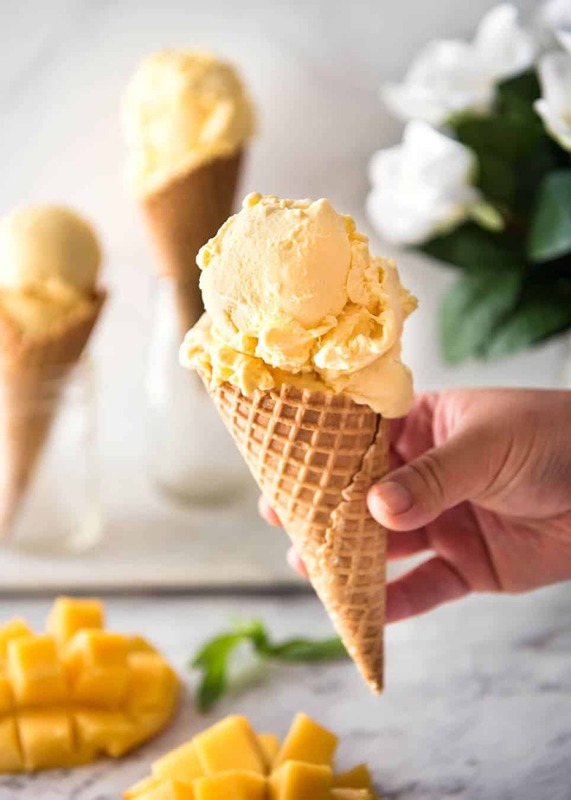 So the key to this recipe to get a good mango flavour in the ice cream is using ripe juicy mangoes with a strong mango flavour. I have expert advice from Aussie Mangoes that the mangoes with the most intense mango flavour and vibrant colour are Kensington Prides, Honey Golds and Pearls. I made mine with Honey Golds which are my favourite. However, this can be made with any type of mango - as long as they are ripe and juicy! <-- KEY POINT! 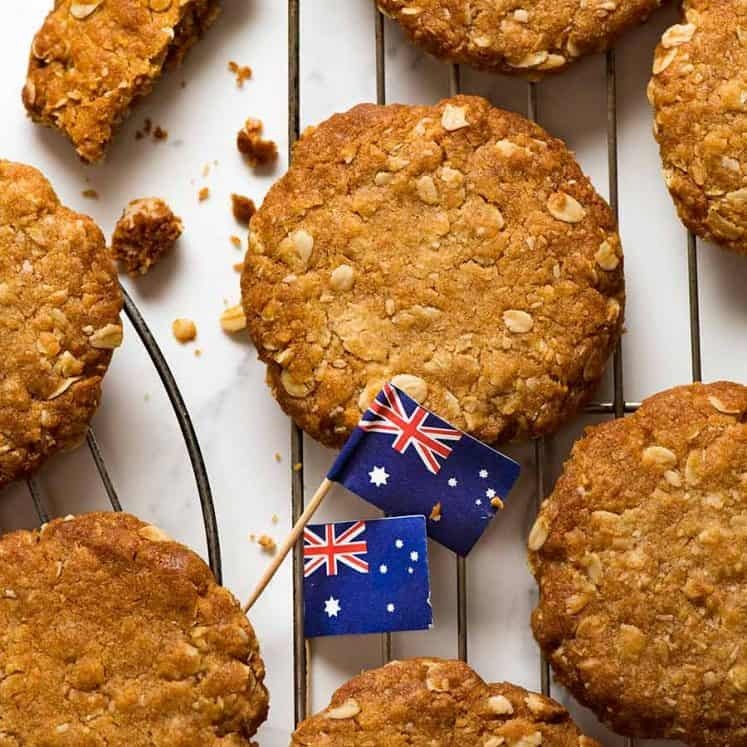 Calypso mangoes are the most common ones sold in Australia supermarkets but I personally don't recommend them for this recipe - the mango flavour isn't as strong as other varieties. 2. Reducing the mango puree by half is key to a) intenser mango flavour in the ice cream 2) avoiding tiny fine bits of icicles (really tiny, barely there) in the ice cream. This is because using plain pureed mango that hasn't been reduced has a much higher water content and the water is what causes the icicles. You can actually skip the step of reducing the mango puree. Just be aware that you will notice some fine bits of iciness in the ice cream. Doesn't bother me at all, it is still SUPER creamy!! 3. Between 12 to about 18 hours of freezing, the ice cream only needs a couple of minutes to soften before being easy to scoop and serve. After that, the ice cream becomes harder and will need around 5 minutes. The unique thing about this recipe is that the ice cream doesn't go from rock hard to melted liquid, it will soften so it's scoopable like traditional ice cream you buy in tubs from the shops! 4. 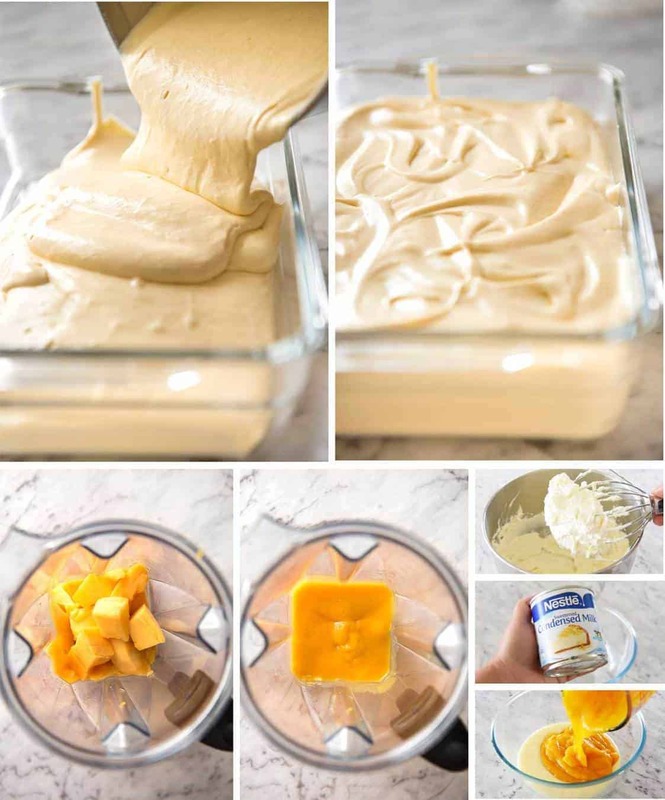 OTHER FLAVOURS: You can skip the mango and just fold condensed milk into the whipped cream and add 2 tsp pure vanilla - this will make a creamy vanilla ice cream. 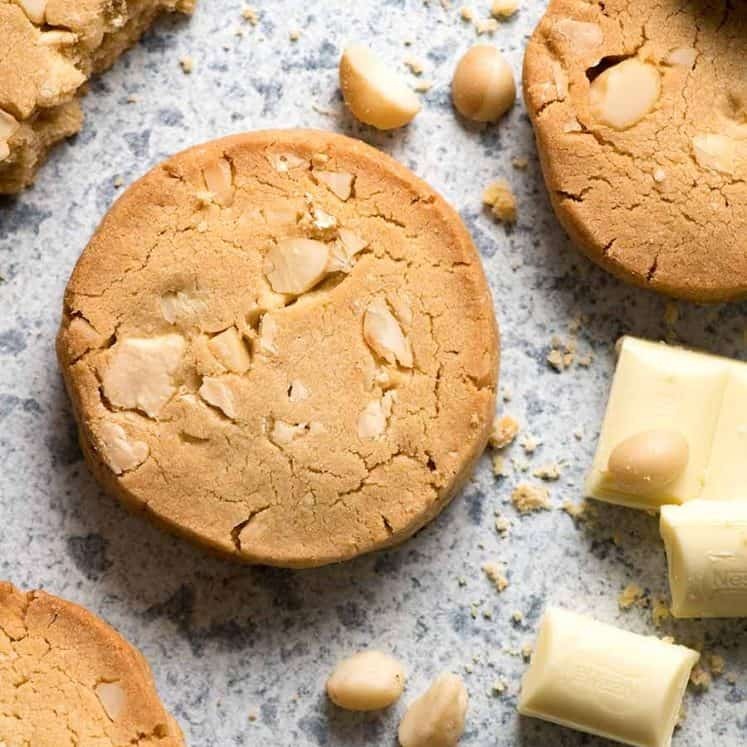 Go wild with add ins like choc chips, nuts etc! To make a chocolate version, I use 1/2 cup unsweetened cocoa powder (or 1/3 cup Dutch processed cocoa powder), whisked into the condensed milk, the folded with the cream. I have not tried other pureed fruits yet and I think it will require some experimenting to make it work. Mangoes works great because a) it is one of the most intense flavoured fruits (did you know that? 🙂 ) b) it purees smoothly and can be reduced without losing flavour. Whereas, for example, strawberries don't actually have a very intense flavour. Watermelon has an incredibly high water content and I don't think reducing would work well. Etc etc. So I can't provide a guide for how to make this recipe with other fruits. 5. This is optional, if you want a nice mango yellow colour. I didn't use it in the photos because the Honey Golds I used were such an intense colour but I did use it in the video. 6. 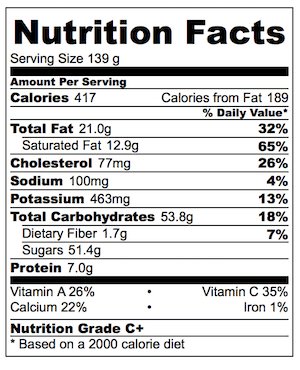 Nutrition per serving assuming 6 servings. Me – currently skiing in Japan. 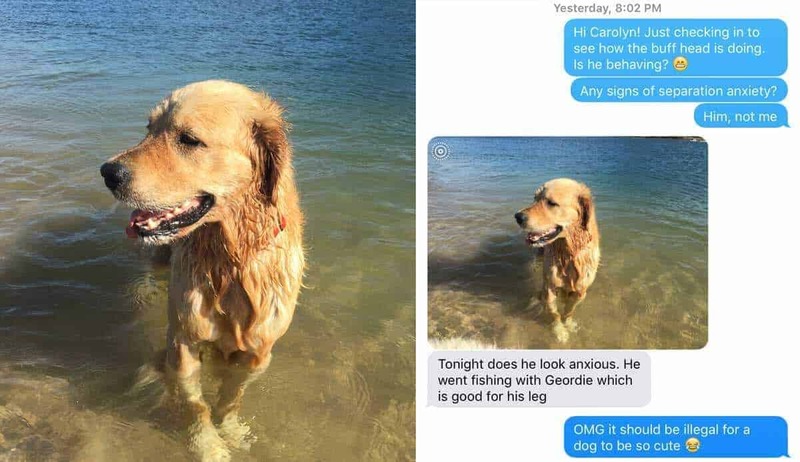 Him – seems to be doing just fine without me…. Hi Nagi, what do you mean by non reactive container? Can i use Tupperware or Silicone containers? Hi Sheila, I avoid using metal – Tupperware would be fine! 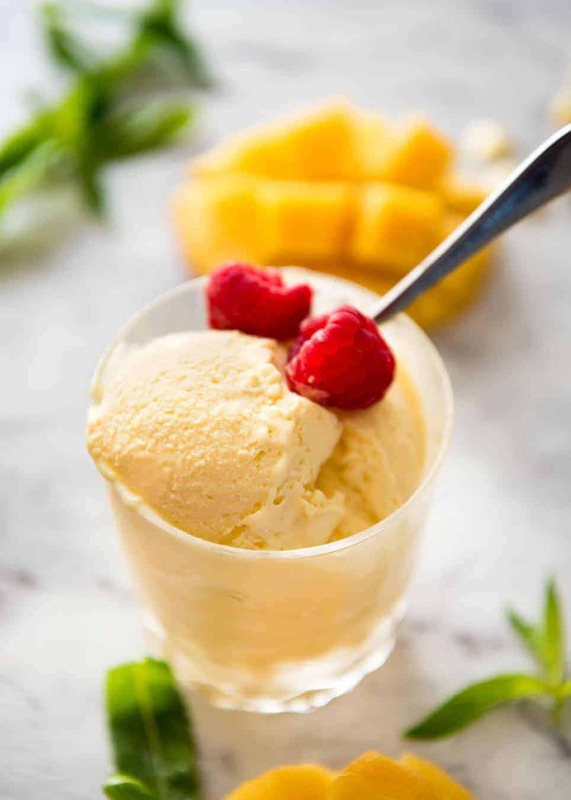 this ice cream is so so creamy and an amazing texture, but I used extra mango and it wasn’t quite as flavoursome as expected – still a great recipe though!! Hi Alice, can I ask what type of mangoes you used? We have a tropical thorny fruit here called Durian. The fresh is very creamy, sweet and pungent. I made ice cream with this. Skip the cooking part because there is hardly any water content in the fresh. Reduce the condense milk by 1/3 . The end result – it is the best durian ice cream ever. Way better than store bought. . Thank you once again for this amazing recipe. There’s nothing more refreshing than ice cream in the summer. This is the one of the best way to get through this crazy heat. This looks healthy and delicious. Thanks for sharing. 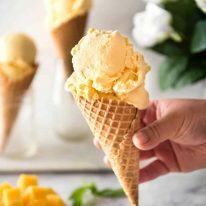 Hi , was looking for fig no churn ice cream could I substitute homemade fig jam and swirl through either mango or vanilla ? That sounds absolutely divine! I haven’t tried but would love to know if it works!! I bet papaya would be good. I made this ice cream and it is delicious. I used frozen ice cream chunks. I defrosted them in the microwave, then mashed them with a potato masher, and then reduced them to less than half the original amount in a pan. I used maybe 30% more puree than the recipe called for. I whisked in the sweetened condensed milk and heavy cream and let it chill in the fridge for a couple hours. After that I put the mixture in my ice cream machine for 50 minutes, and then transferred it to a plastic container and froze it overnight. The ice cream is super creamy and mango-y and yummy. I made this and the flavor is awesome. However, I’m wondering if I did something wrong in the process, because even though the ice cream is cold and frozen, it actually doesn’t feel cold when you taste it. Is this normal? Yeah when you touch it, it feels cold. I confess to not reading the recipe entirely. I put all the ingredients, except the good coloring, into the blender – mixed it up, chilled overnight, and into ice cream maker. Yum!! Thank you! Might try extra mango next time. Hi I tried the same recipe for chocolate ice cream.. it came out so creamy like but I get th raw chocolate flavor when eating.. do u have any suggestions..
Hi Shabnaz! I have not tried this with chocolate yet so unfortunately I can’t say 🙂 Sorry! Is there a way to make it less creamy. Substitute milk for one of the milk products? I made this with my daughter the other day with fresh mangoes from our tree. Tastes great but it’s a bit too whipcreamy. Too dry. Also, whT can be substituted to cut down on the saturated fat? Any suggestions? Hi Craig! Unfortunately I can’t offer any suggestions to reduce the fat off the top of my head. I’m also a bit confused about what you mean about it being too whip creamy? Should I have to cook the purée if it’s store brought ?! Or I can directly add ? Tried this icecream and though the flavour is amazing, the texture seems off to me: it’s so rich it sticks to my palate. I hesitated if I whipped the cream long enough (didn’t want it to turn into butter), could that be the problem? Also, because it was so sweet, I wondered if I could try adding or substituting some full fat Greek yogurt. Have you (or someone else?) ever tried this? Do you know if I can I use frozen cubed mango instead of fresh? I don’t have much choice for fresh mango at the grocery stores right now.